Here is another video posted by the rider who was involved in a crash at an intersection. See more video Lessons here. One thing different about this rider is that he is taking the time to self-analyze his role in the crash and explore how he could have done better. Kudos Hans Solo! I want to stress that in the real world, under battle conditions, we humans will make flawed decisions. It’s what we do. The takeaway is to have effective strategies so we can do all we can to avoid needing to use superhero skills…assuming we have them at our disposal. Hans should be commended. He is doing the hard work of looking in the mirror to evaluate what he could have done differently. That said, I have a different take on what could have helped, so I’ll add my .02 about how things could possibly have turned out differently. Monday morning quarterbacking can come off as smug, but I don’t want to miss an opportunity for my readers to learn from others’ mishaps if we can. Take a look at the vid. I’ll wait. Imagine a rider approaching a cross-street intersection with a white car waiting to turn left across his lane in a dedicated left turning lane. There is a gray car located at 10:00 from the rider who is also approaching the intersection. The rider accelerates to pass the gray car on the right before the intersection when the white, waiting car cuts across both the gray Nissan and the bike. The white car zips in front of the gray car and the bike hits the white car broadside. Sorry the video isn’t available. Using the Dark Blue-Gray Nissan as a “pick” or blocker is often a good plan, but it’s a mistake to do it at the expense of being seen. In this case, Hans moved into the right lane to put the Nissan between him and the left turning cars. The problem is that the white car couldn’t see him as well (not that the driver was even looking) and Hans couldn’t see the white car as well. We call the blue-gray Nissan an eclipse vehicle. Add to that the fact that the road was curving (see :45) in a way that makes Hans even less visible to the oncoming white car and you can see the problems with this particular lane position. One possibility is if he had stayed in the left lane behind the Nissan, he could have seen the white car move earlier. But then if the Nissan hit the white car (they missed by inches), Hans would have needed to be far enough back to be able to brake in time to not rear end the Nissan. In the end, he made a fine decision, but the driver of the white car did something so unexpected that it’s tough to blame Hans for this decision. Lane position plays a huge role in terms of being seen and being able to see ahead. Greater following distance would have allowed Hans to see the movement of the white car earlier. And remaining in the left lane (with lots of following distance) would have allowed him to see past the Nissan. Because intersections are so dangerous, my eyes would be flicking around while my wide vision would be looking for any peripheral movement. You can see the white car move at 1:58. Impact comes at 1:59, so because of his speed he had almost zero time to react. Hans wasn’t riding particularly fast, but his speed could have been better for the situation. Hans says he slowed (and downshifted) before impact, but I don’t hear any significant change in RPM…although he clearly brakes just before the crosswalk. What I saw was a seriously dangerous situation ahead that would have had me rolling off the throttle earlier and covering my brakes. For reference, trimming just 5 mph off of 40-mph travel speed requires about 20 fewer feet to stop. Add to that the reality of perception time and reaction time that further increases actual stopping distances and you can see how much speed affects safety. Read my article in Motorcyclist about reaction time and speed. So, how much time did Hans have to stop? A Nissan Altima is about 16 feet long, so at the time of initial brake application (seen by the front end dive) I estimate the distance between the rider and the white car to be about 40 feet. The speed he would need to be at to get the bike stopped in time is about 25 mph! See this chart from the MSF that documents that a VFR800 needs about 36 feet to stop at 29mph. This is with a trained rider in a controlled environment. Keep in mind that Hans is likely to be an average rider who rarely (if ever) practices emergency braking skills. This means he, like most average riders, can only achieve a deceleration rate of 0.6 g’s even though most bikes are capable of 1.0 g. Add to that the reaction time of the average human is 1.3 seconds and you can see the problem. The point of this article is for us to consider possible solutions that would have prevented or at least minimized the effect of the driver of the white car’s screw up. In this particular case, the white car cut off a large four-wheeled vehicle, so he would have surely cut in front of a motorcycle. This is an extreme case of a driver totally screwing up and is hard to believe. But, that doesn’t mean we don’t still do all we can to prepare for the unexpected. Do what you can to not let it happen to you! That’s about all I got. I hope you heal fast, Hans. Share you thoughts and comments below. Well said Ken, I can understand the rider wanting a buffer between him and incoming traffic but in the video you can make out the white car through the Nissan and rather than roll off the throttle and create space the rider looks to get closer to the Nissan. That would have been a huge red flag to me to get off the throttle and on the brakes. In the last 1/4 of a second before impact, you can actually hear his engine start to rev up, so I guess he did downshift. But if you only have a second to react, downshifting isn’t going to do much for you. He didn’t even have enough time to say “Jesus”. My question is: could he have swerved and gotten around the back of the white car? Yeah. downshifting is a poor substitute or addition in emergency braking situations. If he had more time, the white car would have separated from the Nissan, but not enough, I bet. Besides, most riders can’t swerve worth a damn and statistics tell us that they usually find themselves in just as much (or more) trouble than if they attempted to stop. Watching Hans’ video, like Ken, I felt he was moving quicker than needed (and safe for those conditions) BUT I’m also going to admit it’s easy to be seduced to riding like that on a very familiar route. I treat every intersection (and blind entrance behind my neighborhood Bertucci’s, intersecting 1-way streets in the last quarter mile to my driveway, etc.) as potential trouble zones. I do slow (and crawl a bit at these neighborhood intersections, knowing them well) and I’m an anomaly when I do it; even cars in the rightmost lane resent me slowing 5mph and looking ahead. Speed and wrong lane position. Scary stuff. I’m truly honored to be featured here, thank you! After reading your reply to this, your advice seems totally on point. I have learned even more from this than just the video, thank you Ken! It certainly wasn’t my most defensive riding, just happy to be alive at this point. To anyone interested, I got out of surgery about an hour ago and will recover just fine. Ride safe and enjoy the weather for me, fellas! Thank you Hans for sharing the video so we can learn from it. I’m glad you sound like you’re doing reasonably well. That’s good to hear. If there is a long interim before you ride again, I would suggest taking another riding class before you get back on the street. 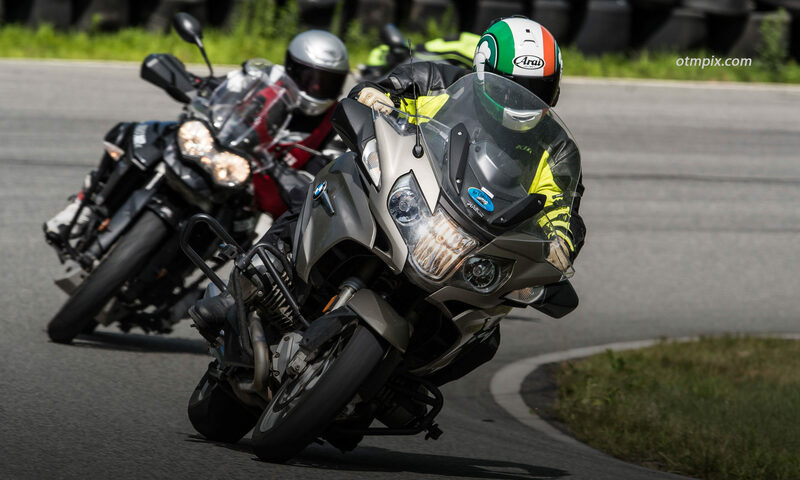 When I was taking some additional classes as a new rider, a man was in my “seat time” class. He was a lifelong rider, but had been in a fairly serious accident, (and not been riding for several months) not dissimilar from yours and felt he needed the class time to bring him back into a good mental place before hitting the street again. I thought “wow, that’s really very smart” and never forgot the lesson or him (or the the smile on his face that day when he was on the course and riding again). Hans! So glad you are recovering. I must say, I was more than a little excited to see your video. I am currently working on a project for my riding group on how we, as riders, need to learn from other riders’ mishaps. You are the perfect example of this. Some riders would have stomped and screamed that it was all the car driver’s fault and there was “nothing” I could have done (the “I had to lay it down” excuse). You went the extra mile to reflect on what you, the rider, could have done differently. While it may be the car driver’s *legal* fault, we as riders almost always can do something to prevent this type of thing. The question is, are we intelligent enough to ask ourselves those questions. My belief is there should always be a “take-away” for you as the rider, and you also had that. Thank you for posting this!!! Thanks for sharing this with us Hans, and for being open to having the world criticize but also learn from this incident. Heal well and be safe all – excellent learning opportunity here. Great to hear you’ll be 100% mended, Hans! Thanks for sharing your video (in all aspects) and story, too. Certainly gives all of us more to think about especially when reading Ken’s analysis, above. Hope to hear of you back on a new bike soon! Ken and Hans, I commend both of you. This is a huge service. I won’t pass judgement, rather I thank you. At the end of the day, intersections are dangerous. I will use what I learned here to my advantage to ride another day. Finally, I love that Hans mentions ATGATT (all the gear all the time). Can you imagine the mess if the dude/dudess had no gear or helmet? Kudos to Hans for putting his video together in the interest of helping other riders … and for his openness to learning. Ken’s comments are spot on (as always), so I won’t repeat, but I would reinforce that riders should recognize that intersections are the leading place for nasty encounters with other vehicles (and intersections include driveways, gas stations, parking lots, etc). Anticipating the turning or emerging car at every intersection eliminates the surprise element, giving the rider more opportunity to plan instead of relying on skills to react. Plus, as Ken suggests, buying more space and time via strategic lane position and conservative approach speed can mean the difference between a crash and just being baffled that a driver would pull such a move (by the way, while there’s no excuse, a 17 year old driver often hasn’t accumulated enough driving experience to recognize speed of oncoming vehicles, what is reasonable distance/gap for turning safely, and what are realistic stopping distances). Hope you guys don’t mind, but I’d like to share this on our Stayin’ Safe rider training page as well. I’m happy to share this on the Stayin’ Safe website. I’m sure Hans won’t mind. He’s been a good sport about this and wants others to benefit from his mishap. In almost this same situation years back I hit the front brakes too hard totally upsetting the chassis and putting the bike into a immediate tank slap which then caused me to have zero control over the bike. My distance from the car was savable but I would have had to go into oncoming traffic or towards the guardrail. The tank slapper was a really bad one so I rode it out into the back of a car. Speeds were much higher in my case and the car had pulled out in front of me going the same way I was going. I learned a lot in my wreck too. I don’t fly in traffic and am so much more cautious. Great. And don’t forget to practice emergency braking. Parking lot speeds are good but try to do some maximum braking at speed on a clear, quiet road.